As of the first day of February, I finished The Moon-spinners for a total of eight books read for Romance Bingo. Unfortunately, no BINGO so far. 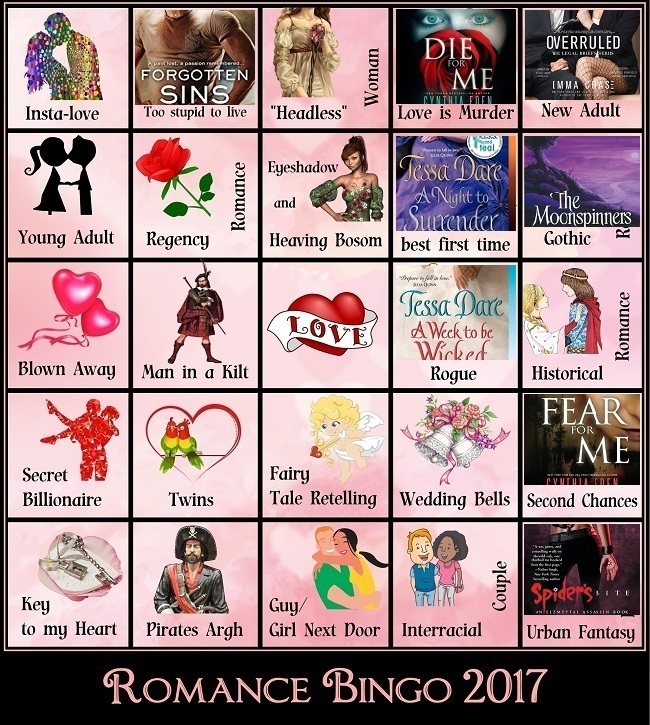 I had been hoping to read one more Tessa Dare book to fill the Historical Romance square for a BINGO, but for lots of reasons, my reading started to lag behind nearing the end of the month. I'm working on a series review for Cynthia Eden's For Me trilogy and will have it posted as soon as I finish listening to the last book, Scream for Me. I'm considering counting this book for Key to My Heart based on our main couple's "I've never felt this way before" monologues along with the whole, "This is the first time I've ever told anyone about my dark, dark past" conversation that just took place mid-book... typical of a lot of Rom-Suspense. Insta-love -- As I mentioned above, I'm hoping that one of the many Rom-Suspense books I read will have insta-love. Young Adult -- I'd like to read Kasie West's newest book, but I'm hesitant to purchase it. Chances are, I will probably listen to the audio book version of The Distance Between Us, my first of Kasie West favorites. Regency Romance -- Many options, probably another Tessa Dare... or maybe something by Amanda Quick. Blown Away -- No idea what to read for this square. Secret Billionaire -- Probably going to just steal some ideas from someone else's square. Fairy Tale Retelling -- I was going to read Daughter of the Forest by Juliet Marillier. But at the rate that I'm going, and with the length of this book, I'm not sure I'll be able to finish it and all the other books before the end of this month. I may just chose another book, like maybe Cybele's Secret also by Juliet Marillier, and also part of my Reading Assignment Challenge this year. Pirates Argh -- Nothing chosen yet. Will have to steal ideas. Interracial Couple -- I have a Rom-Suspense that has an interracial couple, but I don't know if I want to read that one. Any ideas?